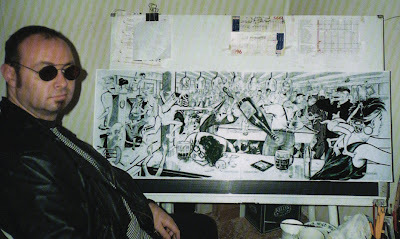 S till on the subject of that big spread, here's a photo of Pete Mullins beside the original art, taken in 1996. Next door to that in my files I have this better photo of Pete posing as Luke Skywalker for a Dark Horse Star Wars cover from around the same time. That was for our brother of the brush and fellow Brisbane artist, Hugh Fleming. 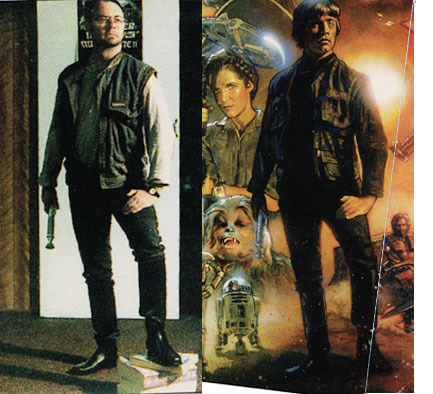 The pictures were in an interview with Hugh in a Star Wars magazine. The Pete image was very small and I've enlarged it and put it side by side with the painted figure. Pete's always busy doing design work for tv. I just served Pete from 1994 at Gosh just then. It was weird.